THE first ever tranatlantic professional rugby club could be set to use Brighouse Sports Club as its ‘home’ for its away fixtures in 2017 . The Toronto Wolfpack was voted into the Rugby Football League in April and is under the guidance of coach Paul Rowley and director Brian Noble. The club is the brainchild of successful Toronto businessman Eric Perez and is one of ten directors including Canadian and Australian businessmen and former Halifax player Adam Fogerty who run the club. He will be the UK-based director to work alongside Mr Noble, Mr Rowley and his assistant Simon Finnegan, the former Bradford Bulls and Widnes forward. It is believed a delegate from the club viewed the facilities at the Brighouse club. Over in Toronto they will play at the 9,600 capacity Lamport Stadium where they already draw crowds in excess of 7,000 for RL internationals. The Wolfpack will be the 16th team in the Kingston Press League 1, the third tier of the RFL. The team are looking to play their home games in batches of four and the same number of games here in England that will see them play in Coventry, Gloucester. Oxford, Hemel Hempstead, London Skolar and South Wales as well its ‘Yorkshire’ fixtures against Keighley, Hunslet, York and Doncaster. 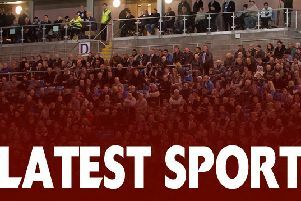 It is expected the players will be called into pre-season training at Russell Way in November in readiness for a season that commences late in January with the early rounds of the Ladbrokes Rugby League Challenge Cup.